Financial markets are made up of a large number of markets for different types of securities: equities, bonds, credit cards, etc. In the market for each asset, supply and demand interact to determine the price and rate of return. Since each financial market is both a source of borrowed funds and a destination for saving, each financial asset is a substitute for every other financial asset (to greater or lesser extent), and thus, all financial markets are linked, directly or indirectly. For example, if the interest rate on U.S. Treasury Bills goes up, you should expect the interest rates on U.S. Treasury notes and bonds to go up a certain extent also. The reason is that if interest rates on Treasury bills increase, that will make bills more attractive to people who normally invest in Treasury notes and bonds. As people shift their savings to bills, the interest rates on notes and bonds will rise. In this section, we will explore these two features, that asset prices or rates of return are determined by supply and demand, and that all financial markets are linked. These features will help us understand later how monetary policy works. Financial markets can be analyzed by using the theories of supply and demand. Those who save money (or make financial investments, which is the same thing), whether individuals or businesses, are on the supply side of the financial market. Those who borrow money are on the demand side of the financial market. In any market, the price is what suppliers receive and what demanders pay. 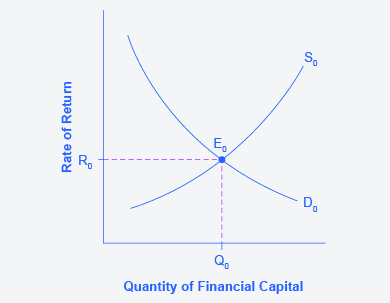 In financial markets, those who supply financial capital through saving expect to receive a rate of return, while those who demand financial capital by receiving funds expect to pay that rate of return. A rate of return can come in a variety of forms, depending on the type of investment. The simplest example of a rate of return is an interest rate. For example, when you put money into a savings account at a bank, you receive interest on your deposit. The interest payment expressed as a percent of your deposits is the interest rate. Similarly, if you demand a loan to buy a car or a computer, you will need to pay interest on the money you borrow. Let’s consider the market for borrowing money with credit cards. In 2015, almost 200 million Americans were cardholders. Credit cards allow you to borrow money from the card’s issuer, and pay back the borrowed amount plus interest, although most allow you a period of time in which you can repay the loan without paying interest. A typical credit card interest rate ranges from 12% to 18% per year. In May 2016, Americans had about $943 billion outstanding in credit card debts. About half of U.S. families with credit cards report that they almost always pay the full balance on time, but one-quarter of U.S. families with credit cards say that they “hardly ever” pay off the card in full. In fact, in 2014, 56% of consumers carried an unpaid balance in the last 12 months. Let’s say that, on average, the annual interest rate for credit card borrowing is 15% per year. Thus, Americans pay tens of billions of dollars every year in interest on their credit cards—plus basic fees for the credit card or fees for late payments. Figure 1 illustrates demand and supply in the financial market for credit cards. The horizontal axis of the financial market shows the quantity of money that is loaned or borrowed in this market. The vertical or price axis shows the rate of return, which in the case of credit card borrowing can be measured with an interest rate.Table 1 shows the quantity of financial capital that consumers demand at various interest rates and the quantity that credit card firms (often banks) are willing to supply. Figure 1. Demand and Supply for Borrowing Money with Credit Cards. In this market for credit card borrowing, the demand curve (D) for borrowing financial capital intersects the supply curve (S) for lending financial capital at equilibrium E. At the equilibrium, the interest rate (the “price” in this market) is 15% and the quantity of financial capital being loaned and borrowed is $600 billion. The equilibrium price is where the quantity demanded and the quantity supplied are equal. 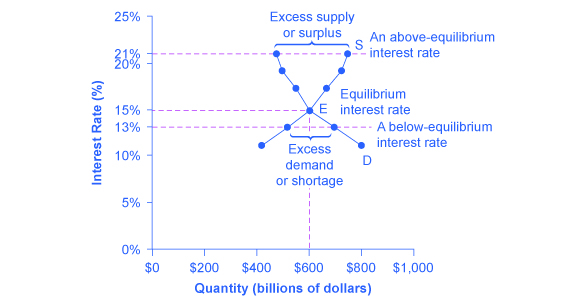 At an above-equilibrium interest rate like 21%, the quantity of financial capital supplied would increase to $750 billion, but the quantity demanded would decrease to $480 billion.At a below-equilibrium interest rate like 13%, the quantity of financial capital demanded would increase to $700 billion, but the quantity of financial capital supplied would decrease to $510 billion. Those who supply financial capital face two broad decisions: how much to save, and how to divide up their savings among different forms of financial assets. We will discuss each of these in turn. To this point, we have been looking at saving in total. Now let us consider what affects saving in different types of financial investments. In deciding between different forms of financial investments, suppliers of financial capital will have to consider the rates of return and the risks involved. Rate of return is a positive attribute of investments, but risk is a negative. 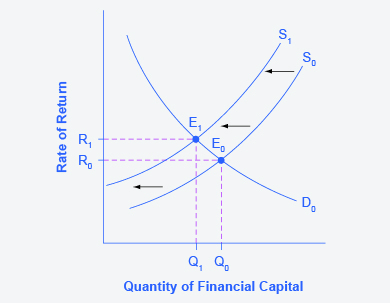 If Investment A (say, stock in a struggling corporation) becomes more risky, or the return diminishes, then savers will shift their funds to Investment B (say, U.S. Treasury bonds)—and the supply curve of financial capital for Investment A will shift back to the left while the supply curve of capital for Investment B shifts to the right. In the global economy, trillions of dollars of financial investment cross national borders every year. In the early 2000s, financial investors from foreign countries were investing several hundred billion dollars per year more in the U.S. economy than U.S. financial investors were investing abroad. The following feature, which should look familiar from the earlier module “Applications of Supply and Demand,” deals with one of the macroeconomic concerns for the U.S. economy in recent years. Imagine that the U.S. economy became viewed as a less desirable place for foreign investors to put their money because of fears about the growth of the U.S. public debt. How would this change in perceptions about the desirability of investments in U.S. public debt affect the equilibrium price and quantity for capital in U.S. financial markets? Step 1. First, we will draw a diagram showing demand and supply for financial capital that represents the original scenario in which foreign investors are pouring money into the U.S. economy. Figure 1 shows a demand curve, D, and a supply curve, S, where the supply of capital includes the funds arriving from foreign investors. The original equilibrium E0 occurs at interest rate R0 and quantity of financial investment Q0. Step 2. Will the diminished confidence in the U.S. economy as a place to invest affect demand or supply of financial capital? Yes, it will affect supply. Many foreign investors look to the U.S. financial markets to store their money in safe financial vehicles with low risk and stable returns. As the U.S. debt increases, debt servicing will increase—that is, more current income will be used to pay the interest rate on past debt. Increasing U.S. debt also means that businesses may have to pay higher interest rates to borrow money, because business is now competing with the government for financial resources. Step 3. Will supply increase or decrease? When the enthusiasm of foreign investors’ for investing their money in the U.S. economy diminishes, the supply of financial capital shifts to the left. Figure 3 shows the supply curve shift from S0 to S1. Step 4. What does this mean for U.S. financial markets? Foreign investors’ diminished enthusiasm leads to a new equilibrium, E1, which occurs at the higher interest rate, R1, and the lower quantity of financial investment, Q1.